Auctioneers selling a museum collection which included 6,000 stuffed animals, have raised more than £500,000. Just three lots failed to sell at Mr Potter's Museum of Curiosities at Jamaica Inn on Bodmin Moor. 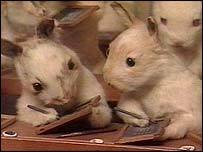 Among the items on sale during the two-day event were stuffed animal tableaux created by the Victorian taxidermist Walter Potter. One Potter piece, The Kittens Tea and Croquet Party, sold for more than five times its £3,500 guide price. A telephone bidder paid £18,800, including buyers' premium, for the scene of 37 stuffed kittens sitting at a dinner table and playing croquet. It was Mr Potter who started the collection with his own work in 1861. Since then successive owners have added to the museum which has been on show at Jamaica Inn since the 1980s. A stuffed North American grizzly bear which featured in the television series Steptoe and Son also far exceeded its £1,500 guide price, selling to a telephone bidder for £7,638. Also sold on Wednesday was a stuffed ferret which accompanied the character Compo in the television series Last of the Summer Wine. It sold for £411 compared to a guide price of up to £80. Bonhams' auctioneer Jon Baddeley said he was "absolutely delighted" with the sale, which raised a total of £529,800. "I think there is a particular interest in taxidermy but it has just been slightly dormant," he said. "I never really believed we would get Americans flying in from the States, but it turned out to be truly international." It was hoped the collection would be sold in its entirety to a single buyer, but no suitable offers were received ahead of the August cut-off date. Controversial artist Damien Hurst said on Tuesday he had offered to buy the collection for £1m, but with the auction already under way it seems he stepped in too late. The funds raised will be used to pay for the expansion of Jamaica Inn. "It's been described as a museum of curiosities"